Keystone Restoration Ecology specializes in eliminating bank erosion and creating fish habitat through Natural Channel Design and Induced Meandering techniques. We specializes in working with the natural processes of deposition, meandering, and establishing floodplains to regenerate a healthy watercourse. Natural channel design arose from the patterns and processes involved in channel and floodplain formation. Natural channel design techniques use the power of flowing water to deposit sediments, re-direct the flow, and grow vegetation to stabilize the stream. An effective design involves understanding the history of the site, the present disturbance regime, watershed conditions and vegetation in order to design a project that maximizes the potential of the site. Induced Meandering is used to treat gullies and other degraded stream types propelling them to achieve a stable stream type over time. 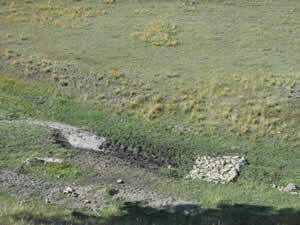 Structures are placed in such a way to cause erosion and deposition creating a floodplain and causing more meandering. 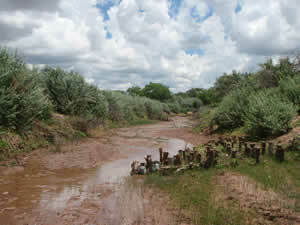 Floodplains created by erosion and deposition have stratification of materials, with a cobble layer underneath the floodplain allowing for stream banks to saturate and sub-irrigate riparian vegetation. A floodplain created by bulldozer will not have these properties and consequently will be much harder to saturate and to establish with vegetation. 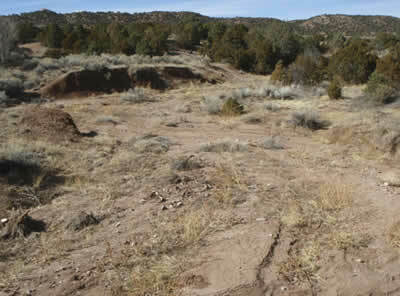 Proposed area for a rock J hook structure designed by KRE. 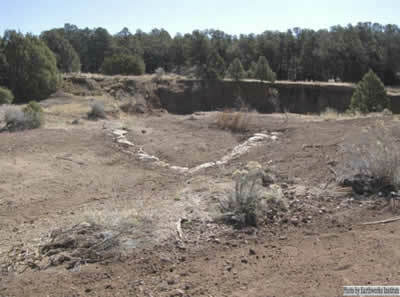 Same area after construction of a J hook rock structure. Built by Dryland Solutions. Same area again photo taken 4 years later after vegetation has established. 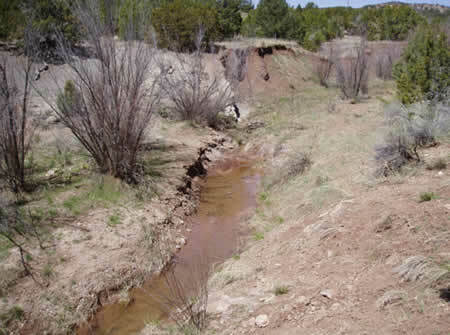 Bank erosion is usually a symptom of poor watershed conditions leading to excess sediment and water. 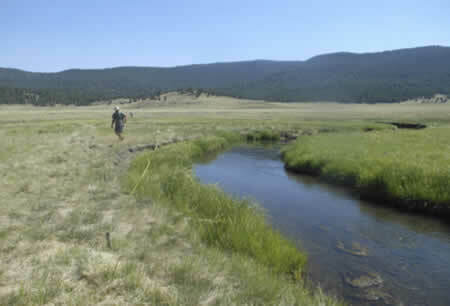 The stream attempts to adjust to these conditions by widening through bank erosion, which is a natural and healthy response to increase the size of the channel. 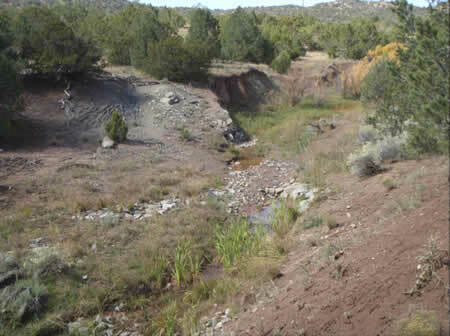 However, bank erosion can become a feedback loop, as the sediment eroded off one bank is deposited downstream, causing erosion on the next outside bank, depositing downstream and again leading to more erosion. 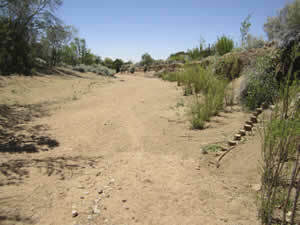 Several techniques are available to reduce bank erosion, stabilize banks and prevent this excessive meandering. 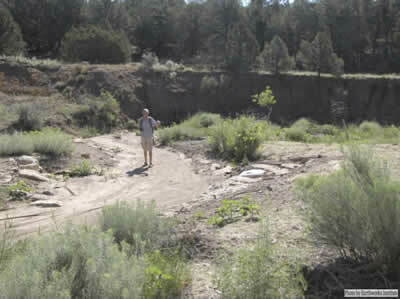 Once the excessive bank erosion is reduced and the bank is stabilized, riparian vegetation such as willows or wetland plants can stabilize the bank for the long term. 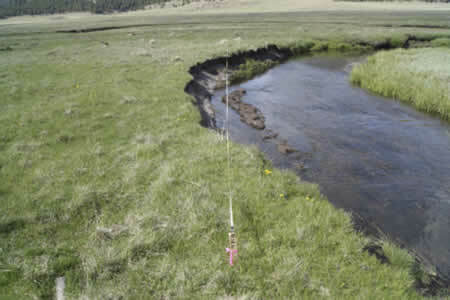 Where conditions are drier, a variety of "Vane" techniques can be used to reduce bank erosion. Vanes can be constructed out of boulders, entire logs, or a series of posts as in "post vanes". A series of post vanes provide effective bank protection. Planting is also important as the treatment will be more effective and will get stronger over time as the vegetation spreads and gains vigor. 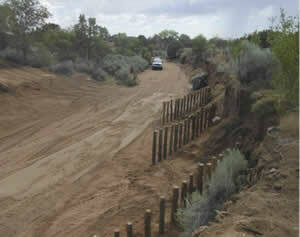 Looking downstream before wooden post vanes are installed to protect eroding bank on photo right. Vane posts installed direct water away from steep banks and over to created floodplain on the left. Same bank treatment with willows and cottonwoods planted to direct water flow away from bank on photo right. 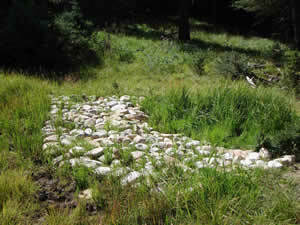 Where stream conditions allow for the growth of sedges and rushes, these wetland-obligate plants can be used as "sod tiles" for bank stabilization. 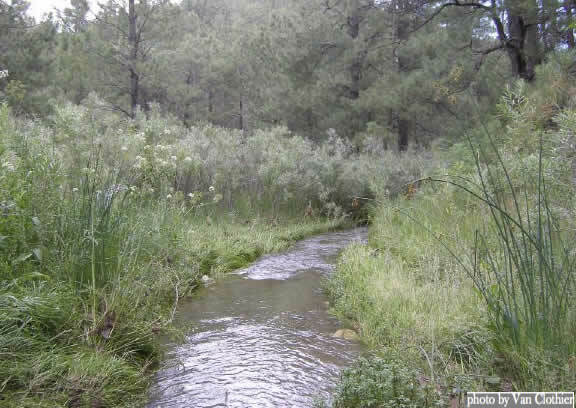 The stream irrigates these plants and deposits sediment to bring this vegetation up to bankfull/floodplain elevation. Some of the most successful treatments we have used for bank stabilization involve removing Carex utriculata (Northern Territory Sedge) from the inside of the point bar and replacing it across the stream on the eroding bank at floodplain elevation or below. 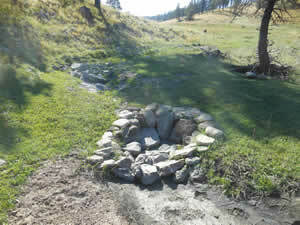 In order to regenerate dry landscapes, rainfall and snowmelt flows need to be slowed and spread across a greater area. Increasing infiltration rates on the land will promote the re-growth of vegetation – the long-term solution to erosion problems. 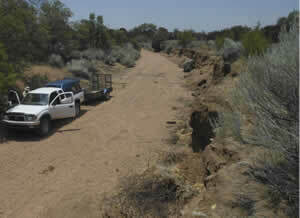 Gully restoration using natural channel design involves changing the Rosgen Channel type from an unstable, eroding to a stable channel with a floodplain. Working with channel evolution prevents unpredictable erosion in unwanted places, which usually leads to more instability. 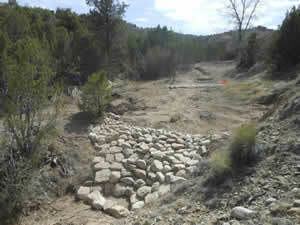 Our techniques work to remove the energy from the system, forcing erosion to widen the channel and preventing the "flanking" often seen in check dam or gabion structures. Each structure we use was created from a natural example seen in nature, and is used in the appropriate landscape position.